Sometime during 2012, improbably and to my great delight, Steve Taylor followed me on Twitter. Steve Taylor, the legendary rocker, the guy I'd been trying to get in touch with for several years, followed me--so I followed him back and then fainted on the couch. A few months later I direct-messaged him an interview request, and voilà! His reply was something like "Of course! Come stay at our house! Bring your kids! We will feast and dance and so on!" When I was a teenager in the 1980s I owned all of Steve Taylor's music. It existed in the form of blue plastic Sparrow label cassettes, and summer after summer I wore them out in my Walkman. Steve had something no other artist labeled Christian had: a sense of irony. While Amy Grant brought us to tears with "El Shaddai," Steve attacked the racism, consumerism, hypocrisy, and self-righteousness of our evangelical communities. The first time I met Steve Taylor was at a mall food court in Nashville circa 1991. I interviewed him then, too, for my college newspaper--and later met him in London where his band was opening for Squeeze. But those are tales for another day. For now, here's what happened when I took my daughter Natalie (13 at the time) to Steve Taylor's house to discuss rock, art, creative process, and a bunch of other stuff on April 27, 2013. This interview was generously transcribed by Hannah Vanbiber. Aaron Belz: Well, let's talk about music a little bit. I think my most natural questions are questions of process and origins. Like where you first started making songs. I started with drawings when I was in fifth or sixth grade. Steve Taylor: Really, that was your first artistic endeavor? AB: I had Koh-i-Noor pens and blue pencils so I could do cartoons for the school newspaper in ninth and tenth grade. And that's definitely connected with my creative process, like sitting at my little desk upstairs in my room. Because where it started was visual, and then I got into verbal stuff. But where did you start? ST: Just this week we were in the studio and my bandmate John showed me a bootlegged version of Superstar: The Karen Carpenter Story --I think it was the first film by director Todd Haynes and it was all shot using stop motion Barbie dolls. ST: So he's showing me this ultra-quirky short film, and we started thinking about the Carpenters and then I remember, when I was in seventh grade, the assignment in English class was to write a parody--like, take a popular song and do a parody of it. I ended up using "Close to You." I did a song about Howard Cosell, who was a famous sports writer at the time. AB: Wait, "Close to You" by The Police? ST: No, by The Carpenters. AB: Oh! "Close to You!" That one! Yeah! ST: [Sings] "Just like me, they long to be, close to you." Right? AB: That's in Dumb and Dumber , too. Eminently parodyable. ST: Yeah, it's so easy. So I wrote a parody about Howard Cosell--it came fairly easily and I thought, "I think this is good!" But my English teacher flipped out over it. She couldn't believe it. I don't think she was convinced that I had actually written it. And that might've been the first time where it's like, "Oh!" Natalie Belz: Where you realized you were awesome. ST: Yeah, yeah, let's cut to the chase. NB: Everyone has those moments. AB: Yeah, we all realize that we're awesome at some point. NB: That's when we try to do stuff. ST: [Still laughing] I wouldn't quite put it that way, no. But, you know, it came fairly easily and it made people laugh, and, well, you know about this--the thrill is when people laugh. When you do comedy, there's no better experience than making people laugh. ST: It's way better than applause. That's all fine--that's all gratifying--but when you make people laugh, that's like a drug. Of course when you write songs, you don't get people to laugh out loud, but the thought of doing something that was maybe clever, or that amused people, or was something that they'd want to tell other people about or quote. That was appealing. AB: Yeah, you did move into that stuff. So it started out sorta verbal. ST: It did. And when it came to music (I've got a degree of musical talent that I don't want to be disingenuous about because I think it's there, it just did not show itself until later), when I was playing the trombone in junior high and high school, I was no prodigy. In fact, I remember specifically--I think it was in 10th grade--the very moment I realized, "Wait a minute, the goal is not to put the slide in the right position and hit the right note. It's not math. I'm supposed to be making music here." Over the next few years I excelled at music theory and composition, and when I got to college, even though I could barely pass piano proficiency, I picked up college level theory and composition quickly. So making music followed the verbal art of lyric writing. It was a way to extend it. AB: So, in high school, you started with words. That's what I really wanted to get to. That's really cool to know. Because that comes through quite a bit, like your songs are very language driven. Which may be one thing that really appealed to me about them--that there was such quick movement in the language. I kept saying to Natalie, "Cloneliness is next to godliness." There's puns and stuff in there. AB: You ripped 'em with puns. Well, I interviewed you in 1991 in Nashville. Here. ST: In where--what was the context? ST: 'Cause you were in England? AB: I was at Covenant College. With Chagall Guevara. AB: We had you guys come down and play. That was my initiative. So I came up and interviewed you, and put it in the student paper before the concert so that students could read a little bit about you. ST: Yeah, right! Where did we meet? Did we meet at my house? AB: It was at a food court or something. It was '91--that was a long time ago. ST: That was a long time ago. Dang. AB: I asked you about some of your influences and you said, "Bowie." I said, "I don't know that much about Bowie," and you were like, "WHAT?!" AB: That was pretty great. But I never put my stuff into music. I wrote a couple of songs, but they're just so silly. ST: Were you starting with words, too? AB: I write verses, but I don't know how they become songs and I don't know that they need to be. So you started in college. Were you developing songs, were you making songs? Did you have a band in college? ST: I actually did. My family is middle class but I was a really good student and won a scholarship to go to Biola College in Southern California. I somehow got into a pretty good rock band with some other students. We did like one gig, but I was such a bad bass player--I think they were too nice to fire me, so they opted to break up the band instead. I just never had the playing gene, you know? I lost my scholarship after a year--I couldn't maintain the grade point average. So I came back to Denver and enrolled at Colorado University in Boulder where tuition was much cheaper. AB: I thought you grew up in California? ST: I was born in California but we moved to Denver when I was five. There was a lot of music in our church, of course. And when I returned to Denver to finish college, I always had a couple of bands going, and typically I would play bass. I discovered The Clash when I was a sophomore in college, and that was a big moment because I loved their lyric sensibilities and I loved that they were able to form a band even though most of them could barely play their instruments. So the thought that you could have a rock band without being able to play was very appealing. AB: Yeah, we talked about that, too. I didn't have London Calling yet--all I had was the second one. And then I got London Calling and now of course it's one of my top five albums. That's the kind of album where during different parts of your life, certain songs become more important. Spanish Bombs is threaded through the last fifteen years of my life. They made really pretty music, singable. It's a little bit like Bowie in how satisfying across the board it is. Like when Bowie's on, you can sing it, you feel it. ST: Yeah, it goes deep. I mean, that's the thing about music. That's the appeal. We were talking about comedy earlier, which makes people laugh, which is a great feeling and it's immediate. But there's something that happens when music connects with you in a way that goes deep into your soul. That's probably why music has always been the touchstone. AB: Yeah. It somehow brings out something in us that's most basically human. When it's good, it's definitive, like it defines moments and periods of time. AB: And also in a bad way. One of my students came to class and she was crying. I said, "What's wrong?" She said, "We broke up. After a year," or something. A couple months later, I was like, "How are you? You doing better?" She was like, "Yeah, I just had to burn my iPod, but I'm fine." AB: I realized that if you share music with someone, how can you listen to it again? ST: Like you've lost that music, too. AB: Okay. I want to hear about space, equipment, and process. So, where do you work? Where do you work best? Do you write here? Do you write in a studio? ST: When I write music, I'll write in some kind of a workroom. But when I write lyrics, I either have to be in a place where there's noise, like a coffee shop, or I have to be traveling. So, the Natchez Trace is 25-30 minutes away, and it's a beautiful, winding parkway that goes from Nashville all the way down to Natchez, Mississippi. There's no signage or commercial traffic, so I'll often just drive along at 50 miles per hour and speak into some kind of voice recorder. AB: So you speak them? ST: Yeah. I think my process has changed in some ways in that when I was a recording artist, the music and lyrics would typically come at the same time. But it's been 20 years since my last album, and since that time almost everything I've done musically has been producing or writing lyrics for someone else's melodies. So a lot of my lyric writing is more craft-driven, and it's more difficult, I think, than when the music and lyrics develop simultaneously. I just started working on a new album, so I'm going back to the old process. AB: It's seems like even when you're not writing something toward an end, you still want to keep up the practice of making those things. So making a three minute or four minute pop song--some of your great songs are two and a half minutes, not very long--you could do that, you could! Or like Daniel Johnston. Just make a lot of songs. ST: It's funny you mention him because one of my happiest moments was when Sixpence played South by Southwest, opening for Daniel Johnston right when the Kiss Me record was blowing up. AB: Wait, that was how long ago? ST: That was '99 I think. AB: Oh, cool because a friend of mine just opened for him at South by Southwest. During this most recent one. ST: No way! Who was that? AB: His name is Jason Russo--he plays for a band called Common Prayer. He also plays and tours with Mercury Rev. ST: That's crazy! There was a woman who wanted to do a documentary on me and during her pitch, she mentioned that she was Daniel Johnston's niece, and I'm like, "If you get me a signed T-shirt, I'm in!" She sent me two of them and she sent me a photo of Daniel signing them. I like Daniel Johnston a lot. AB: Well, the way that you write isn't the way that Daniel Johnston writes. Because he just drools songs. AB: People are kind of envious of those guys. AB: But they're not all great because there's not a lot of pressure on each one. Similarly, like Mountain Goats, or Guided by Voices. Robert Pollard made all of these tiny songs-- Alien Lanes has 28 songs on it. And they're beautiful, but they're so small, fragmentary, kind of like "Her Majesty" on Abbey Road . That quick little melody. So do you ever just do that? Because it seems like you have so much firepower in what you want to craft. ST: That's a good question. I haven't done a lot of that. I think I end up putting a lot of self-imposed pressure on achieving--if not a sense of forward motion, at least a sense of minimal competence. I just had a band send me a song and they needed verses for an existing chorus. I didn't mean to sound like a snob about it, but I just said, "There's no way I can have my name attached to this chorus. I'll be glad to write a whole new lyric, but this chorus is demonstrably bad. I don't know who wrote it, I don't want to trash anybody's lyrics, but I wouldn't want people thinking I wrote this chorus." There are times when I like the challenge of having to come up with verses for a preexisting chorus because I like the craft challenge. Probably the hardest thing I ever did was when Veggie Tales were doing their second movie, The Pirates Who Don't Do Anything . You know how a lot of those movies have a montage in the middle where something significant in the story changes? They had originally wanted to use a cover version of "The Pirates Who Don't Do Anything" that I'd recorded with Relient K, but when they showed it to Universal, the studio didn't think the song worked for that section. So they gave me this three and a half minute stretch of animated story--it's set in stone--and asked me to write a new song that fit with the montage. It was the hardest assignment I've ever been given. It had to be a certain length. It had to work musically with the tone of the visuals. It had to comment on what was going on onscreen without describing it, so it had to add subtext. I loved the challenge, and I'm still really happy with the final product. Auden claimed to have written a poem in every meter style that had ever existed. And if someone came up with one he hadn't heard of before, he'd write it down and try to create a new poem in that meter. Pure craft, right? So I like the craft of songwriting. And I like the challenge of creating lyrics that are hopefully poetic but also singable, which is the hardest thing about writing lyrics in that you have to create something that can be sung by a human voice without sounding forced. AB: One thing I understand about your career is that for the first ten years or so, you were much more like an individual artist making albums and songs. Then you had a little transition with Chagall Guevara, and then you came back with Squint and since then you've been doing a lot of production of other people and mentoring of other people. ST: There was a short period, right before we started Chagall, where I produced a band in England. AB: So then you moved to the studio more. Out of the hot seat a little bit. AB: But what interests me is the part of your career that's more relevant to me. That's what my touch point was, even beyond the film stuff, which is your passion now. So I know it may be old news. ST: I haven't thought about it for a long time so it's new news. AB: Is making songs--making your own new songs, from music to lyrics to production--at all in your future? ST: Yeah, it is now because the process of getting the Blue Like Jazz movie funded was so long and frustrating that after three years of failure, I remember thinking, "Hey, I used to do music, and compared to movie-making it was instant gratification." You go to a studio and you come out with an album a few months later. Whereas with a movie you could be working on it for seven years, which is not atypical. The initial part of filmmaking--screenwriting-- is collaborative because I'm working with co-writers, but a lot of the rest of it prior to production is on your own: imagining scenes, making pages of notes, storyboarding, etc. And I was just ready to get back in the studio and start hanging out with friends and making music. So we actually started recording a new album and got pretty far along and then this Kickstarter campaign happened, which kind of came out of the blue. And we were actually in the recording studio watching the Blue Like Jazz campaign take off. We were probably two or three months away from having this album done and then the movie got funded and from that moment on--two and a half years--it's been movie non-stop. So now we're back in the studio getting this project finished up. I have no idea if there's any demand for it or if anybody will care. AB: With any of the same guys? ST: It's with the same three guys I was with before the movie got funded: John Painter was in a band called Fleming and John and I've collaborated with him many times over the years, and he's probably the best musician I've ever worked with. Peter Furler, of course, was the lead singer and main songwriter in Newsboys, and he's playing drums. And then Jimmy Abegg has been a friend for a long time. He's also a visual artist but I knew him from back in California when he played with Charlie Peacock and was in a band called Vector. But yeah, it's the four of us collaborating on the music and then I write the lyrics and sing. I think it's good! I believe it was Randy Newman who said something like, "The goal, as you get older, isn't necessarily to get better--it's just not to get way worse." AB: Not everybody hits that goal. AB: Just keep listening to Ziggy Stardust ... I guess maybe that's different in different kinds of arts. Because people in the visual arts, I don't know that there's a fallowness that sets in. ST: No, I think that they arguably get better and better. AB: Could it have something to do with the social and energetic side of popular music? Once you become less social and energetic, and more settled, your imagination follows? ST: And certainly most of the people we know, we know because they became really successful. AB: You lose the hunger? AB: That's why poets don't ever have that happen because they never have success. They just keep pursuing the poem. I think more in terms of the poem. I like to give readings and I like approval--I love a big audience listening, there's nothing like it. But that happens a couple times a year. Usually it's just me and my study. And Natalie making tea in the living room. It is a lot more about the product. Very much product-oriented. So that's why my questions are skewed that direction. Because I was always just giddy about your product. It doesn't seem confined to youth or thirties, I think because of the way your brain works and the particular view you have of the evangelical Christian world. Which to me sounded like you came from a little bit of a fundamentalist or Baptist background. ST: Yeah, it was Baptist. AB: But then that turned into a kind of healthy cynicism and righteous anger about hypocrisy--particularly American hypocrisy. I don't know if I'm explaining that right. ST: No, that's pretty good. AB: That editorial sense of your early work--you still probably have those feelings, right? ST: Yes. For the most part. AB: So you've got all the pieces. I just listened to older U2, it was the one that has "In a Little While." ST: Was that the one with "Beautiful Day" on it? AB: Yeah. All That You Can't Leave Behind . I got a little obsessed with "In a Little While" and then I read about how they wrote it--they had been drinking and they were just sitting around jamming and wrote it as a group. I don't have a sense of that, writing as a group. I'm very protective of my page. I've only once or twice collaborated with people. But I will roll out five or six poems in a day and just keep one or two a week. ST: Throw that many away! Oh, really? Wow. AB: Yeah, because they're just too much. Maybe I should say this and see if you connect with it at all: It seems like your process is much more produced, elaborate. Like when you write a song you want it to work on all levels. So you can't just make a little crappy Daniel Johnston song. AB: But the virtue of being Daniel Johnston is he can make fifty of those and one of them everybody loves. So it's just a totally different paradigm. That's mine. Mine's much more like Daniel Johnson. I write junk. Some days I even make a goal of writing bad poetry. Which is kind of arrogant because I'm arguably already doing that. But I'm always lowering the bar. Like I want to get the bar as low as I can get it. AB: That would be unusual, by the way. ST: So you're doing your editing after you've written the poem and it's the end of the week and now you're deciding, I'm only going to keep these two. So you're still editing. AB: Well, sometimes I give a few readings and I try them out. Honestly it's been a bad couple of years. The last two years have been tight. I've got time but I've lost some of that magic. I was writing from '99 through 2000 to 2008 or '09. I could write a lot of stuff. Because my mind was like a big bowl of jelly --I don't know what was going on. I could just sit down and pick poems out of it. Now I sit down and I'm like I gotta write a letter and I wanna take a nap. And I'm kinda mad. I've written some stuff though, but it's a little bit different. I don't have the same freedom. But I know that's what works well for me, is to sit and say, I'm gonna try this out, tercets, I'm going to write in threes. ST: So you start with a form. AB: Sometimes. Or I like to write a crazy sentence to start with. Usually the poems are an argument for the first sentence. The poem is a case that the first sentence makes sense. And trying to contextualize it in a way that is plausible. So I have my own little gears and wheels of how that works. But back to U2, when I hear about them writing "In a Little While," which I admire, I would like to have a community setting where more people could be making something. And I felt like I could do my little virtuosity as part of it. And I don't know how that works for me. ST: Yeah, I can't imagine how it would. Writing poetry seems like a singularly solitary process. Whereas, you know with Chagall Guevara, those lyrics were a collaboration between Dave and Lynn and me, and we'd sit in a circle and just keep working the lyrics. Sometimes one of us would go away and refine something but it had to go through the mill. AB: So you'd write the music first? ST: Yeah, I think the music always came first. Maybe the music and the title. AB: Ah, because the music sounds like what it's about in a sense. I'm thinking of "Monkey Grinder"--that sounds like it's got a little carnivalesque element, a mysterious element like a magic show and something is starting to happen. AB: I saw a very successful collaboration between two poets where they had each taken turns writing a line. But they were like lovers or something. Both completely bizarre, avant-garde poets, so you could see how this weird chemistry between them was turning into these beautiful poems. And I kinda liked it but I didn't find them very appealing as people. So, do you have a band name for this group? AB: Do you have songs that you've recorded? ST: Yes. Nothing's mixed, but I think it's good. If you were familiar with my past recorded output, you would pick up similarities to it. But a lot of my songs from earlier recordings are pretty topical. These songs are not as topical. AB: So that's one thing I noticed between your earlier stuff when you were doing Chagall, and later. I said, 'This in some ways is better as music." Like the music is richer and has more muscle. But I can't explain what's important to me about each song. I know each song, but I can't explain it as well as I can explain what's important to me about "Sin for a Season." Because that was, almost in an elementary way, example, chorus, example, chorus--you almost would think "That's dumb," but it's so good! Like it's very effective. And I don't think it's just effective for a young person listening. That kind of simplicity--Auden did it, in "Refugee Blues" and others. I mean, he wrote poems that were really, really simple. Dylan does it. What do you think about where Dylan's gone? ST: Well, of course I admire him. AB: I mean, the most recent two albums--they're pretty Dixie, bluesy. ST: I feel perfectly comfortable being critical of Bowie, but I fear criticizing Dylan. It's almost like he knows more than all of us. But I will say I saw him live recently, and it was excruciatingly boring. AB: I keep waiting for something to really pop, that's anything close to Infidels . ST: It's funny you said that because Infidels was, for me, his last great album. I really love that album. AB: Speaking of, there's a really great documentary of Mark Knopfler's guitars. One of the other Dire Straits members made a 40 minute documentary of Mark Knopfler's guitars, beginning with his first one. He takes you to the shops where he got them--later in his career when he's got the money, you see the maker of the guitars. And they also play the music from that time in his career. And the later stuff just kind of tails off. But you go back to "Down to the Waterline," and it's crazy, just powerful. ST: Yeah. And Infidels was part of the documentary? AB: Oh yeah, Infidels was great for Knopfler being on it. ST: Yeah, I love that album. I still listen to that album. AB: Yeah, that's one of my go-to's when I'm really struggling emotionally. And recently Shot of Love has popped up. I didn't realize until I was shuffling Dylan how much a couple of those songs meant to me. There's like a sad gospel song that's almost a capella, and then it turns into "Saved," the second song on the album. It's a great song. ST: I gotta pull that out again. AB: It reminded me of the beginning of a Kanye CD. Where he introduces a kind of blues vibe and then he just punches it. Like I can't take this anymore. ST: Speaking of topical songs like "Sundown on the Union," I mean obviously we know exactly what that song's about but it's still got a great punch to it, still fires me up when I listen to it. AB: Has "I and I," though. ST: "I and I" is so good! ST: "Jokerman" is so good! AB: The portraits of women in those songs are as compelling and unified as any portraits of women. ST: Oh yeah, "What's a sweetheart like you doing in a place like this?" AB: That song almost makes me cry, though. The one about "crawl across cut glass to get to you." See, his verbal abilities--he doesn't do that anymore. That comes from something inside of a person. The instinct to make those words in that pattern. That's a sweet spot for someone, I think. When was that? ST: I think like in '80. Right in there. But let's switch to Leonard Cohen. AB: Leonard Cohen's most recent album is awesome, though! How did he do that? ST: I don't know. But that's where, when I see someone like Leonard Cohen, I see it is possible to keep getting better. So why don't most artists? AB: What is it about Leonard Cohen? Because I don't think it can be replicated. You can't say, "You should be like Leonard Cohen." ST: No, but it is possible to say, "You should be better." AB: Well, first of all, there's a simplicity in Leonard Cohen. He's not trying to reinvent the wheel. He just keeps making the same wheel. He's not trying to be better than what he's been. He's just brutally honest about himself. NB: Maybe he doesn't care. AB: No, I think he cares. He's Canadian, sweetie. ST: They're very polite and they care very much. That might be why. I love his lyrics--I'm not crazy about listening to his music, though. I'm not a big fan of his singing. Okay, so Darkness --you haven't heard it yet? ST: No. I've got Spotify, so I should just check it out on Spotify. AB: Some people thought it was horrible. Oh, "Show Me The Place"--I don't know, is he a Christian? "Show me the Place" sounds like a Christian hymn. ST: Well, he definitely knows something. AB: Yeah. Going Home is another one. ST: Do you guys need some more tea? AB: Other earmarks of this guy--I'm thinking of someone like Sting. I liked Dream of the Blue Turtles . But there were some things on Blue Turtles that I thought were like red flags. Like that Russian song--I was like, "I don't know man, that's not quite right, there's something wrong with Sting!" And the next one, he just lost me. So is it something to do with his celebrity and what his priorities became? AB: Because Cohen doesn't seem like a guy who's gonna host any award shows. He's kind of like an old curmudgeon. ST: Right. I wonder if there's a humility to it that recognizes that the creative gift is still there but it requires work and effort and a certain amount of self-awareness. Also, a certain ability to step outside of yourself and try to look at what you're doing objectively. Another example is U2 who are still writing really good songs, and Bono, who started as a mediocre lyricist is now a really fine lyricist, and has gotten progressively better. AB: But they seem unique. ST: Well, they're an exception, certainly. It's a spiritual discipline almost, that recognizes that we're nothing special and that gifts have to be protected and nurtured. I think as a Christian especially, you're always hoping that the Spirit breathes life into something, but you also have craft involved. I'd like to think at the end of the day there's a spiritual component to all of this that makes it possible to keep doing good work. Because it requires humility on top of everything else. And that humility is what's most lacking with a lot of artists. Ultimately, what either destroys careers or destroys objectivity is the point where you think, "Oh, yeah! I'm successful because it's what I deserve!" ST: What? You took a class from Ginsberg? At Boulder, at Naropa? AB: No, it was at NYU. This was '94. It was really cool and he had guys like Gregory Corso and Lawrence Ferlinghetti come in and teach. ST: Wow! That's wild! Was he a good teacher? AB: Yeah, he was great because all he really did was read his favorite poems of other people and explain why. He also talked about process-- he taught us his process. We also challenged him because when I was in college we learned that he never revised. It was "first thought, best thought" that was the dictum from his group. And his work was very stream of consciousness. ST: Did he ever change that idea, that theory? AB: Well, we asked him about it because he wrote a poem on the board and then said, "I like it better like this" and changed some stuff. And we said, "What about first thought, best thought?" It was almost like there was a ten second rule. There's a little window for revision as long as it's happening now, it's still the moment. He would do all the work of writing and revising in that moment and then be done with it. But he was a celebrity poet. You look at some guys like James Merrill--he was in the tradition of Auden--poets that don't get seen as much, that are very good but lurk in the shadows. They have the opportunity to continue on. One of those French poets like Rimbaud or someone said the greatest privilege that he had was spending most of his career writing in complete obscurity and because he had freedom. AB: I guess we could look at exceptions to the rule and look at who made great stuff when they were 60+. I don't know, Paul McCartney? ST: Right, it would be a pretty short list. ST: Yeah? He's arguably stayed as good or maybe gotten better in some ways. AB: Well, I don't know, it would be interesting to figure out. Maybe our faith can help inform that and fix it. AB: Because there is a calling. The calling is not to be successful but to have good stewardship of your skills and your gifts. I hope it's not to be successful. ST: I have an inner dialogue going of: "Does this hold up?" "Am I still going to like this in 20 years if I'm still alive?" We're playing a couple of live shows this summer and so I had to go back and listen to all the old albums to figure out which old songs should be on the set list. I haven't done that in a long time and it was a reminder that certain things hold up really well and I'm happy with this one, and others it's like, "What were you thinking on this line?" AB: You could fix stuff, too. Can you edit things even though it's been committed to vinyl? ST: That's an interesting thought! Speaking of Auden, he did that a lot. AB: Yeah, I studied Yeats--he notably wrote some very different versions, and the later versions are usually better with Yeats. ST: What do you think of Auden, are his usually better? AB: Nah, I haven't looked at Auden's. ST: I think with music, people would be upset--I don't know why. Maybe it shouldn't matter, because it's a really good question. Maybe because they're fixed in a certain time, particularly, and they're attached with music--recorded music is hardly ever truly timeless. Certain songs become that way but they're very much of their time and they sound like their time typically. AB: So they have to be stuck there? ST: It seems like they do, yes. AB: Joni Mitchell said in her song "Blue," "Songs are like tattoos / You know I've been to the sea before / Crown and anchor me." Once you get the tattoo, you can't go back. Jackson 5 can't go back and change "ABC." ST: They should've started later in the alphabet. AB: [laughs] It becomes like a parody. We listened to Weird Al Yankovic and I said, "You know, for some reason I associate Steve Taylor and Weird Al" ... and now you say your first song was a parody. ST: Yeah, that's funny. I was never really a fan, but the times I listen to him I think, "I could do that better." Maybe it's because I started with parody. It's a stupid thing, but I get bothered by too many near rhymes. Well, I like Kanye a lot, but he's such a master that it doesn't bother me. But when lesser writers use a lot of near rhymes, it really bothers me. AB: Well, I rarely listen to Weird Al, just so you know. I think there was just something of the spunky irreverence of Weird Al, that when you get back to some of your more bizarre-sounding songs they sound like wiggly. ST: When I was living in California, I really didn't know their music at all, but I had a lot of people tell me I reminded them of Oingo Boingo. 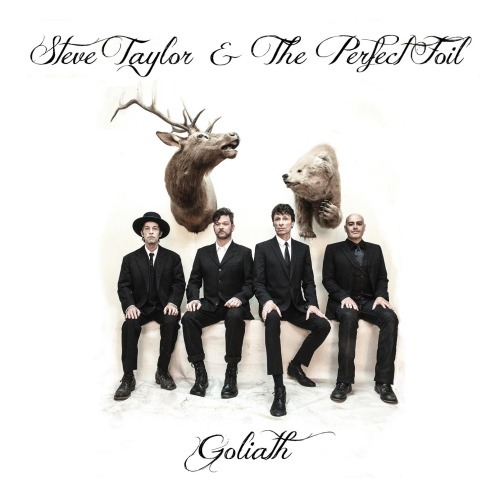 Steve Taylor comprises one fourth of the rock band Steve Taylor & The Perfect Foil, whose debut album Goliath was released in November. He also moonlights as a film director--his latest movie Blue Like Jazz premiered at the South By Southwest Film Festival and was released theatrically by Roadside Attractions. Steve lives in Nashville with his wife, the artist D. L. Taylor, and their daughter. 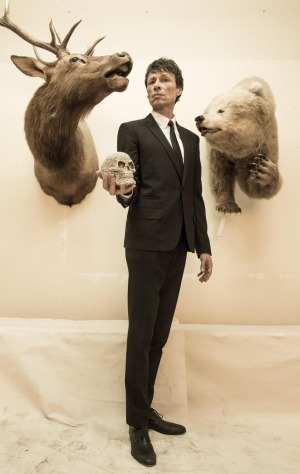 You can follow him on Twitter @theperfectfoil and SteveTaylorPresents.com. Aaron Belz's latest book of poetry is titled Glitter Bomb. He lives in Hillsborough, NC.